Alcohol and tobacco are independently associated with various cancers, but together they are synergistic carcinogens when they meet in the upper aerodigestive tract. i.e oral cavity, pharynx, larynx, as well as oesopahgus. Squamous cell carcinomas of these sites are common, and are typically seen in elderly men who chronically abuse alcohol and tobacco (either smoked or chewed). Men who use both tobacco and alcohol are at far greater risk than men who use neither or those who use only one. The cancerous effect of tobacco and alcohol together is more than simply the sum of the two independently. Also, those who survive these cancers for any significant length of time are at increased risk for a second primary cancer in the upper aerodigestive tract, at a rate of up to 7% per year. This phenomenon is believed to be due to "field cancerization", whereby multiple individual primary tumours develop independently in the upper aerodigestive mucosa as a result of years of chronic exposure to carcinogens. Despite the strong causative association, the cellular mechanisms through which the combination of alcohol and tobacco lead to cancer are not at all clearly delineated as yet. In line with smoking trends, oral squamous cell cancers are on the rise in women. In contrast they have been increasing in younger men without the traditional risk factors of smoking and drinking: Human papillomavirus (esp. Type 16) has been implicated in a new subset of oro-pharyngeal cancers and these HPV-positive cancers have different risk factors and clinical behaviour. Squamous cell cancers can occur anywhere in the mouth but the typical sites are the ventral (under) surface of the tongue, floor of mouth, soft palate, gingiva (gums) and lower lip. The cancer is pre-ceded by pre-malignant lesions (dysplasia) that are quite variable in appearance e.g. firm pearly plaques or irregular rough areas of mucosal thickening. As they progress to carcinoma-in-situ and finally carcinoma, they become protruding, ulcerated masses with irregular, rolled borders. These cancers tend to invade locally before metastasising to local lymph nodes and eventually to distant organs. They are aggressive cancers and despite disfiguring surgery [e.g. glossectomy (removal of the tongue, mandibulectomy], radiation and chemotherapy, the five year survival is around 50%. 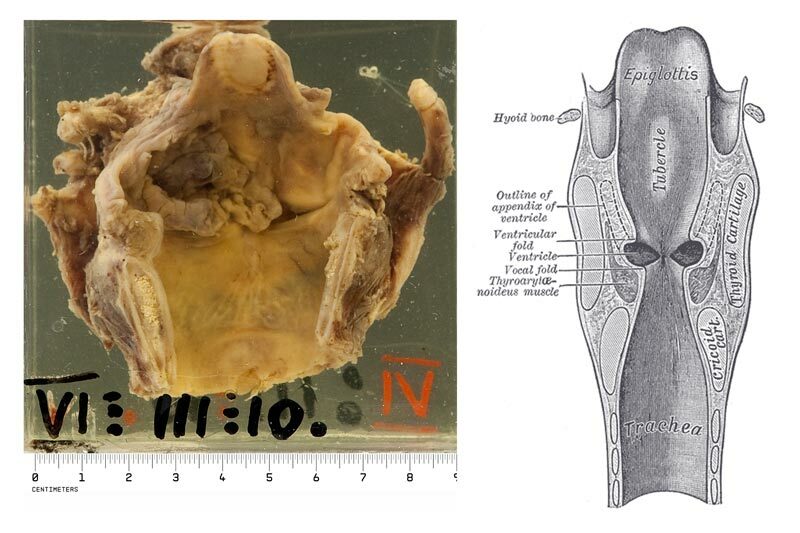 This specimen includes floor of mouth, tongue, vallecula, epiglottis, larynx and upper trachea. 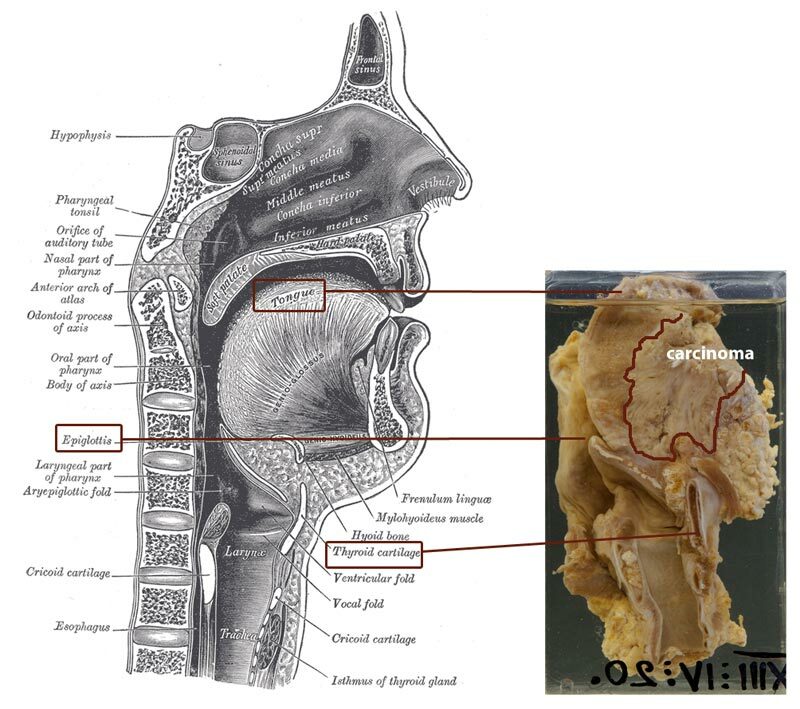 A large, yellowish-white tumour can be seen extending from a large ulcer beneath the tongue, posteriorly almost to the base of the epiglottis. It has not broken through into the larynx yet. It had extended into the submaxillary salivary gland. None of the deep cervical lymph nodes examined contained metastases which is surprising in view of the extent of the tumour. On histology this was a moderately differentiated, keratinizing squamous carcinoma. 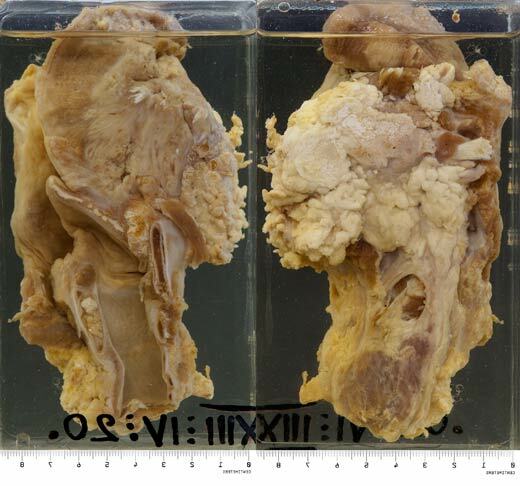 At autopsy this patient had cirrhosis of the liver, presumed due to alcoholism. The lesion was a squamous carcinoma microscopically.